Is McIntyre in for a good push? This week's Raw was pretty decent as the show was more focus on Strowman's elbow injury and his upcoming match with Baron Corbin at TLC. They were some other angles involving Rollins and Ambrose, which was really fun. We saw some amazing promos in Smackdown from Charlotte Flair and the "New" Daniel Bryan, which reminded me that why WWE is the best wrestling promotion in the world because it focuses on the overall story and not just the wrestling part. Drew McIntyre returned to the main roster in April 2018 and has been an integral part of the main event storyline ever since. Instead of just pushing him directly to the title picture, writers took time with him by involving him in the tag team with Dolph Ziggler. 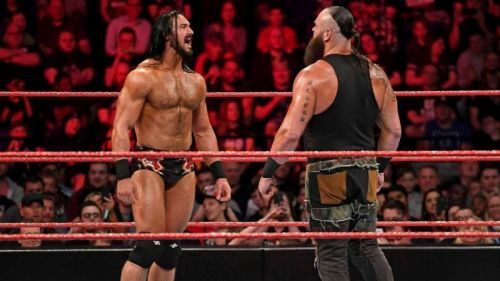 From there, he slowly started having a feud with the Shield and then with Braun Strowman and Finn Balor. He may not be in the Universal Title picture at least till Royal Rumble 2019 as Strowman may face Brock Lesnar there. But, it is a blessing in disguise for him as he can then have a feud with someone else to establish his character and give time to the fans to get used to seeing him as a big match commodity. Same goes for Randy Orton as well. Like Drew, WWE is slowly building him up. Even though he has some experience of being the face of the company in the past, WWE is establishing him as a sadistic heel before giving him a title run and has already left a scar on big wrestlers like Jeff Hardy and Rey Mysterio. It is refreshing to see that the writers are not booking either of them like a coward, which WWE likes to do with their heels. They are instead portrayed as fearless beasts. A big push is just around the corner for both of them.